Ringworm (Tinea Corporis) of the body is a fungal infection on the top layer of your skin and characterized by a red circular rash with clearer skin in the middle that may itch. 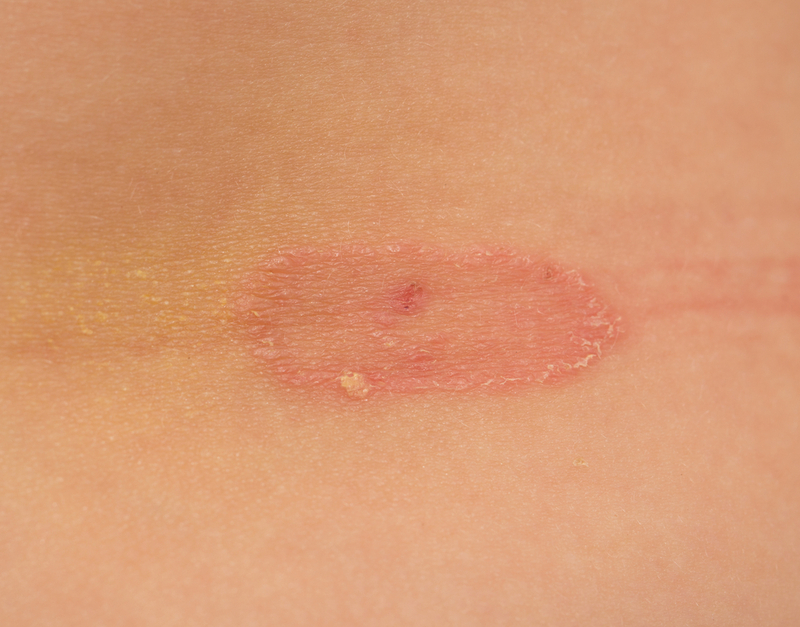 Ringworm gets its name because of its ring-like appearance and there is actually no worm involved at all. Ringworm is contagious and is is caused by mold-like parasites that live on the cells in the outer layer of the skin. It can be spread several ways: human-to-human, skin-to-skin contact; animal-to-human contact from petting or grooming infected animals (cats, dogs and cows typically); human contact with an object touched by an infected person (towels, hair brushes, etc. ); and soil-to-human, as occasionally infected soil can spread ringworm after continued contact. There are several related skin fungal infections: ringworm of the body, athlete’s foot (tinea pedis), jock itch (tinea cruris) and ringworm of the scalp (tinea capitis). Symptoms of Ringworm: Ringworm typically begins as a flat, scaly area on the skin, which may be red and itchy. This patch develops a slightly raised border that expands outward — forming a roughly circular ring. The shape of the ring may not be even and may resemble the wavy outline of a worm. The interior of the ring may have a bumpy rash, be clear, or scaly. There may be more than one ring and they may intersect or overlap one another.